i’m so excited to tell you all that dermorganic is now available at sachi salon. this fabulous trio of shampoo, masque, and leave-in treatment (which i’m having my own personal love affair with these days) is now my most favorite new sauce. click here to read about the treatment. DermOrganic® products are made to be 100% vegetarian. DermOrganic® contains no animal by products and has never been tested on animals. 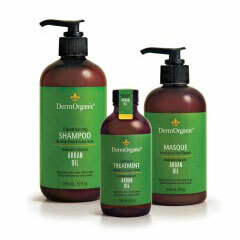 DermOrganic® products contain no sulfates, parabens, glycols, DEA, MEA or colorants of any kind. Gluten-Free. DermOrganic® products are Alcohol-free, and our products are naturally preserved. Previous Post it's like a dream come true!